Come and join us for the very last gym crash of the year. Grab your rope and your commitment shoes (plus the rest of your climbing gear) and try out the new lead routes that have recently been put up by The Hangout’s staff. Grades vary from 14 – 25, including one which is volumes only (let’s see that balance put to work). 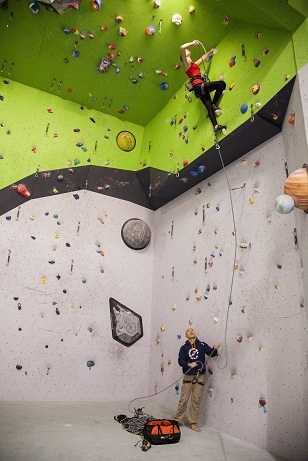 There are also a number of top ropes to try your hand at, which includes some new routes along the back wall. The bouldering section has just been reset with colour coded problems. So with lots to keep you entertained, come along for the evening and meet some new people – maybe even trade in your old climbing partner for a better looking one?! Chat to us about our upcoming climbing trips as well as the Xmas BBQ. Dena will be happy to answer any questions about the technique course later in November (details coming soon). She’ll be the one wearing a Santa hat. Pizza: We will be ordering tasty gourmet pizza at around 7:00 pm to satisfy your well-earned hunger. Cost $ 5 per person. We will also be selling guide books for $25 and the last of our CAWA t-shirts (women’s only) for the bargain price of $ 5 each. Please bring correct money. To find us in the gym, look for the new CAWA banner over towards the lead wall. Gym crashes are a member benefit. Joining online is easy via the CAWA website homepage. If you have suggestions about any aspect of gym crashes, please feel free to approach one of the committee members or send us an email. We are currently shaking things up a little bit and trialling gym crashes every second month to make way few new activities. We will keep you posted.